Wendy Engelberg, founder and organizer of Girlz Gone Riding, is far from where she was in 2005, but not yet to where she (and over 500 of her closest female biking friends) is going. Girlz Gone Riding (GGR) is transforming the women’s mountain bike scene and is here stay, to grow, and ladies, they are going to make you want you to join them. But it’s not what you think. GGR is the furthest thing from an anti-male, feminist bike group. No, they don’t hate men, in fact they love them, are married to them, have sons, and friends who are men. This is more. It’s a safe-haven for women bikers. You know that one thing you have always wanted to do? You should do it. At 41 years old, going through a divorce, Wendy needed some kind of release. She had always wanted to bike. A self-described “impulse person,” she marched into the Wheel World and bought a $450 hard tail bike. Not a lot for a bike. And it was not love at first ride. Even more than the actual riding Wendy found the social aspect empowering. 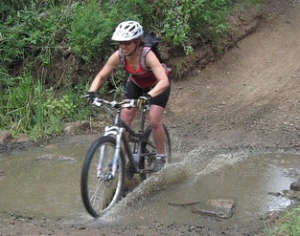 She met friends, and they, in turn, introduced her to North Ranch Mountain Bikers in 2007. The group started to plan biking trips. After work one evening during the holidays in 2010, while at happy hour at the Elephant Bar in Simi Valley, the conversation drifted toward the idea of finding more girls to ride with. After a committee meeting of 10 to 12 women brainstorming, GGR was born and the first group ride was planned for the end of February. Wendy had no problem talking to bike shops, to riders, just inviting all women. It worked. More than double what they expected showed up. They formed a beginning, intermediate and advanced group, based on technicality, endurance and speed. All genres of the sport can find support; cross country, downhill, etc.. But the biggest draw? The 100% positive support for whatever you want to get of your type of ride. And it’s all about independence. One of the most frustrating things for GGR is the lack of attention the female side of the sport gets from bike companies and product suppliers. There are very few choices as far as women’s clothing and gear, or even actual women’s bikes. GGR has made strides with the Newberry Park Bike Shop, which listened to GGRs request for more female bike demos and options. GGR is grateful to CORBA (Concerned Off-Road Bicyclists Association), an organization that maintains the trails the riders utilize as well as Cycle World Chatsworth, Kali Protectives, Newbury Park Bike Shop and JRA Bike & Brew. If you would like to partner with GGR and grow your women clientele, please contact Wendy directly at wendy@girlzgoneriding.com. One of GGR’s largest events, three years and going strong, is the GGR Rocktober XC Gala (this year’s gala is October 19th), bringing all things mountain biking together. The event has drawn the support of Tessa Treadway, team captain of SOCAL LADIES ENDURANCE TEAM, and Amy Rambacher, who explains about a new genre of racing called ENDURO racing. This is not at all pink and frilly. At every level, these are athletes. This past year’s Rocktober was dedicated to Danusia Taber, a CORBA board member who was integral in getting GGR off the ground and was fighting a very private battle with stage 4 cancer. Still, they explained that they had this idea to get bells on to bikes, so that everyone using the trails could hear bikers approaching, and upon hearing the way this could be a win-win, bells and bikes, and money for charity, Danusia wanted to get to work on it. Now the idea of bells of bikes has become a success in every way imaginable, not only promoting safety for all that use the trails, but a $10 donation from every bell sold is going to the Sarcoma Alliance to help those battling cancer. Sadly, Danusia passed away before Rocktoberfest, but with the sound of every bell her memory rings on. To get your bell, go here. Wendy still owns that $450 bike that changed her life, and she continues to change more and more women’s lives every day. GGR is the now largest non-dues women’s bike group, and while Wendy lights up talking about what she has helped to create, she knows that ride isn’t over. It’s just getting started.